Kills the 3 major gastrointestinal parasites most frequently found in goats. Can be safely fed to all classes of goats, including meat & dairy goats – even pregnant and lactating does. Conveniently fed as a top dress, eliminating the work and stress of shots and drenches. Unlike its imitators, Positive Pellet delivers its active ingredient (Rumatel) in a complete, balanced feed. 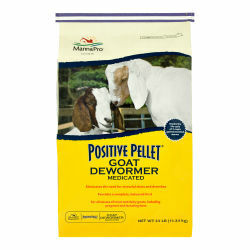 Positive Pellet is a source of essential vitamins and minerals so goats on Positive Pellet do not miss any of the essential nutrients in the daily diet. Positive Pellet minimizes the stress associated with deworming! Feed monthly for year-round protection.